There's no question that the Porsche 911 GT2 RS is a special car. The GT2 RS and has now . The average asking price for a GT2 RS is currently around $542,000, but this is assuming the car is painted in one of its four standard colors or eight optional colors. Porsche also . GT2 RS deliveries are well underway and we have been seeing tons of examples with stunning PTS colors. 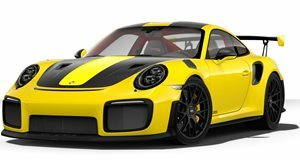 An has been gathering a database of PTS cars and we have chosen 10 of the best colors on the GT2 RS. Let us know which one is your favorite in the comments. This Signal Green GT2 RS was delivered to the Netherlands and is the first known example of this color in the world, though a second example was delivered in Houston, Texas. Of course, this GT2 RS also comes equipped with the Weissach Package featuring satin black accents. Signal Green has also been used on several BMW models. Gulf Blue is a famous color that has been used on many race cars in the past. This GT2 RS also sports orange decals, which harken back to the old Gulf Racing colors. Combined with the lightweight Weissach Package, this GT2 RS is a fantastic homage to racing. Photo credit . The 991.1 generation GT3 RS was offered in a unique shade of purple, but the GT2 RS did not have this option. Luckily this owner in Switzerland opted for a PTS Ultraviolet, which looks incredibly unique. This example is paired with the Weissach Package with satin gold wheels. Photo credit . Mexico Blue is a historic color for Porsche, so it only made sense to opt for it on a GT2 RS with the Weissach Package. The particular example was found in California and sports matching Mexico Blue inserts on the interior. Photo credit . Yachts and Porsche seem to go together like peanut butter and jelly, so this example of Yachting Blue Metallic makes a ton of sense. The color seems to shift between blue and grey depending on the light and looks subtle but cool. Photo credit . The GT2 RS is already a pretty extreme car and doesn't need an extreme color to help it stand out - but it couldn't hurt. This shade of Pastel Orange was spotted in Texas and features Lava Orange stitching on the interior. Photo credit . It may be a boring name, but Light Green is anything but a boring color. This color was formerly known as Birch Green and this example was delivered to Springfield, Illinois. On the inside, the car has stitching in Acid Green, which was a popular color on the 918. Light Green differs from Acid Green because it doesn't have as much of a yellow hue. Photo credit . Dark Sea Blue is seemingly a very popular PTS color because there are reportedly four examples including this particular one in Germany. The dark hue pairs incredibly well with the satin gold Weissach wheels, which really helps the wheels stand out. Photo credit . If you want a color that almost no other car on the road will have, Mint Green seems like a good option. This example was delivered in Omaha, Nebraska, where it became the second known GT2 RS in this color. Few modern cars are sold in this shade, so we love the uniqueness of the color. Photo credit . The Porsche 911 may be all German, but it still looks great in British Racing Green. This example was delivered in Germany and also features unique “Madras Karo" plaid seats that were done via Porsche Exclusive. Photo credit .